This book doesn’t pay strict adherence to traditional Polish cooking. 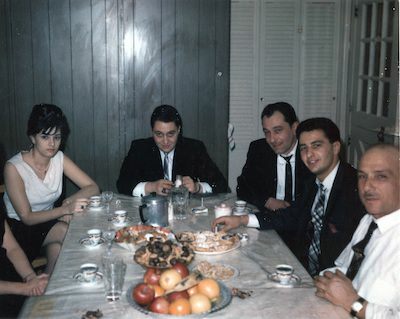 Instead, as Anne Applebaum learned to cook out of necessity, finding herself living in her family’s recently-purchased, dilapidated Polish manor home, she had to cook with what was readily-available. 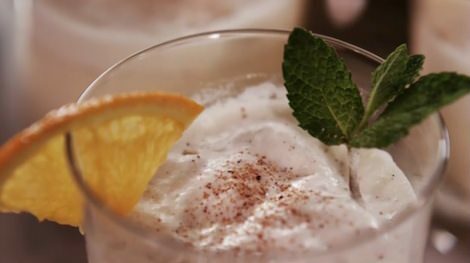 In this way, she took on her own style, using similar ingredients, but straying from Polish techniques to create her own. From a Polish Country House Kitchen begins with vignettes capturing the home’s narrative -- a grouping of chopped mushrooms, a bowl of just-picked plums, and a wooden gate marking the entrance into the garden. In the preface, Danielle Crittenden addresses the seeming absurdity of writing a Polish cookbook and discusses the looks of surprise when she mentions the project. 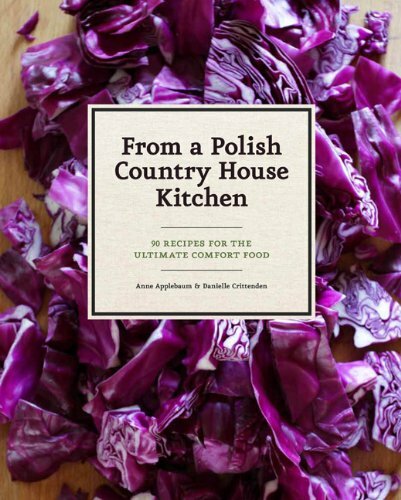 However, she turns on this, saying that the book moves forward from the familiar food of Polish peasantry, instead honoring the culture that has been reinvented and brought to a higher standing. The women take one of the greatest representations of Slavic culture, beet soup, and give three versions that satisfy any range of palates. While the traditional version is heavier in its variety of vegetables -- carrots, parsnips, leeks, celery, root, and mushrooms galore -- they also provide an option made more exciting with the addition of balsamic vinegar. The final recipe is pictured in its light-pink glory, slivers of hard-boiled eggs peeking out from among a garnish of chopped chives and the beets’ vibrant hue. Chicken takes focus in many of the main recipes, like Stuffed Chicken Breasts with Cognac Sauce and Roast Chicken with Clementines. However, a picture boasting chunks of mushrooms in a cream-laden sauce spooned over slices of chicken has me craving the Chicken Breasts with Chanterelle Sauce. Simply browning the chicken on each side, cooking with butter, onions, garlic, the chanterelles, and baking away with a bit of cream allows for a comforting and deliciously simple weeknight meal. When a sweet tooth nags me with its tantalizing images of vanilla ice cream or apple pie, I don’t know why Polish desserts never enter my mind as well. The Cheesecake with Strawberry-Red Currant Sauce trumps all heavy, overly-sweet American alternatives. The authors explain that the difference is in the cheese, where the Polish version relies upon a “farmer’s cheese” to give the cake a lighter, airier texture. The brightness of the sauce lends a hit of color and flavor to the ricotta filling and breadcrumb crust. They suggest eating it with ice cream, thankfully satisfying my American cravings as well. This is the story of an American kitchen coming into contact with the established practices of a Polish one, testing how simple food can change with location, and seeing how it can become your own. In Chocolate and Zucchini, Clotilde Dusoulier transfers readers to Parisian markets, allowing them to get hopelessly lost among the gorgeous haricots verts, be offered a bright-red radish, or sample a bit of tangy Roquefort. Her recipes are geared at taking this simple produce and making a wide array of dishes that vary from the refreshingly simple to the more elaborately complex. Clotilde divides her entertaining section into categories like Apéritif, with lighter options such as the Two-Olive Tapenade or Eggplant Caviar, followed with Impromptu, giving easy recipes for the gatherings you haven’t been planning three weeks in advance, and the more involved Dîner. The latter boasts options like Sea Scallops and Mango with Parmesan Wafers or Comté Cheese Soufflés, but I’m drawn most to the classic Beef Bourguignon, a recipe so well-known that even Americans rely upon it as a dinner party staple. She applauds the dish for its melt-in-your-mouth texture thanks to meat and vegetables left to marinate overnight in a bottle of Burgundy wine. Adding just over an ounce of semisweet chocolate is enough to give a slight sweetness in opposition to the acidic sauce. With carrots, onion, bacon, and beef, this is a hearty dish one can use for any chilly winter night spent with company. Clotilde attributes her love of baking and her passion for sweet things to her time spent assisting her mother by the oven, measuring, pouring, and of course, tasting. She loves watching the chemistry that ensures a mixture of butter, eggs, flour, and sugar will result in something entirely different the moment it comes out of the oven. While the Creamy Mango Ricotta with Macadamia Crunch and the Blueberry Amandine Tart have me salivating with just a peek at their ingredients lists, it’s the Chocolate and Zucchini Cake that stops me on the first page of her Desserts section. The recipe headnote explains how Chocolate & Zucchini came to be the name of her award-winning blog, a combination of ingredients and flavors that seemed to fully-encompass everything she loved about food. Clotilde found it fitting to seek out a recipe for her book that displayed the same surprisingly delicious mélange of flavors. With a healthy amount of cocoa powder and bittersweet chocolate chips, you’ll only notice the zucchini for the moist bite it brings to this cake’s tender crumb. 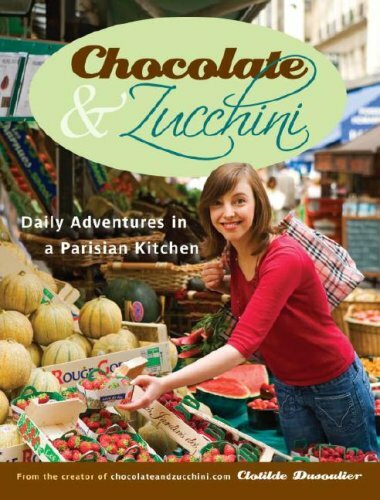 Chocolate & Zucchini is a small-volume exploration into the time-honored but pleasure-filled French approach to cooking and eating. 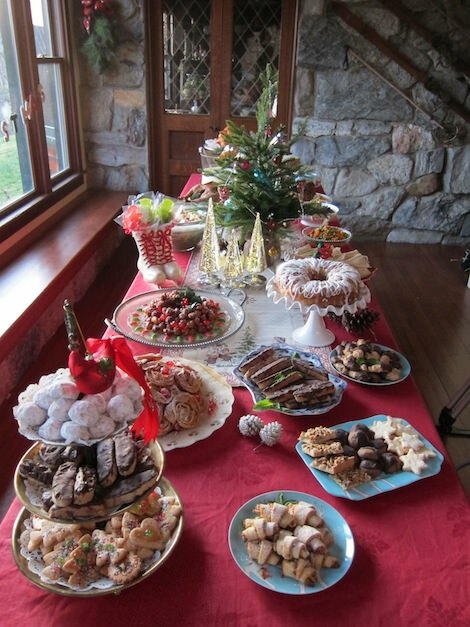 Clotilde gives us an idea of what it is to share in this tradition, beginning with the markets, proceeding to the table, and finishing with a satisfying meal. 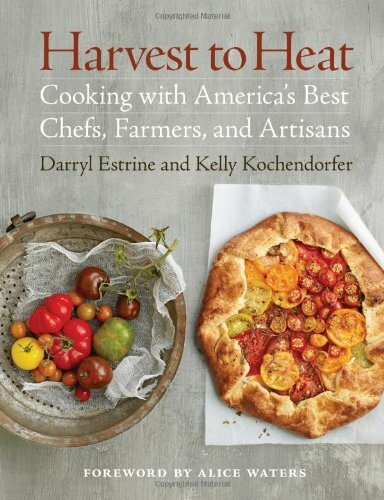 Even before the title page, Harvest to Heat sends us immediately into a world of fresh produce and gorgeous culinary offerings. An array of violet-hued eggplants, plums, and flowers is spread across a two-page spread, prefacing the beautiful images and thoughtful recipes which follow. In the book, chefs, farmers, and artisans come together in sharing their philosophies on what it means to buy, cook, and consume locally. The first recipe, Blue Cheese Tartine, showcases the Bayley Hazen blue cheese from Jasper Hill Farm in Greensboro, Vermont. Though the name sounds fancy, the headnote reassures you that tartine simply means an open-faced sandwich. Toasting thick slices of rustic sourdough bread brushed with a little olive oil and allowing a sprinkling of the cheese to melt on top, makes the perfect base for crispy slabs of bacon and a sweet hit of wildflower honey. It is a composition perfect for breakfast or an easy-to-assemble lunch. Simply made, simply delicious. The Crème Fraîche Galette with Heirloom Tomatoes continues upon the theme of country-style French cooking. A galette makes a beautiful free-form base for a stunning array of tomatoes in every color. A combination of the tangy crème fraîche and the well-developed but not overpowering bite of Manchego sits beneath the tomatoes, creating a creamy consistency when emerging from the oven in its melted glory. I skim through the dessert section, finally settling in upon the Chocolate Pots de Crème. This has always been one of my favorite desserts for its creamy texture and rich bite. Diving your spoon into a jar or ramekin containing the perfectly-set mixture is a small pleasure that is invariably satisfying. The recipe provides a balance of flavors between the heat of fresh ginger and the sweetness of chocolate. This intensity makes for the limited use of sugar -- an ideal result. In the foreward, Alice Waters describes the mission she built her restaurant, Chez Panisse, around. She began with a goal of bringing the culinary aspects of France to California, those which exposed her senses to a new way of eating. However, it grew into a passion for knowing the farmer, their story and the story of their food. She applauds Harvest to Heat for sharing this purpose, for wanting to connect the consumers to producers in a bond sealed by the seduction of simple, well-made food. This book is a nod to the future of American cooking, one where we care not so much for the immediacy and accessibility of our meals, but for the careful development of their history from plant to plate. Looking for a great Holiday Gift?? Give the gift of LEGACY. 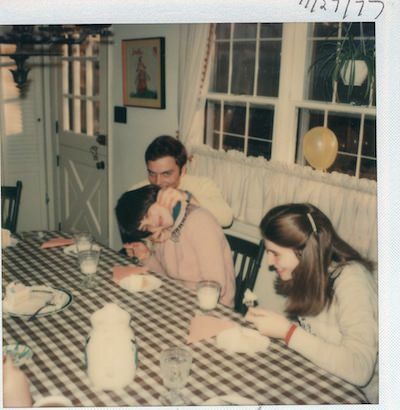 Enroll your mom, family, or relatives in the Heirloom Meals Recipe Project.